A beautiful late June evening, an outdoor concert at Roanoke Island Festival Park and TobyMac and his DiverseCity band on stage — it doesn’t get much better than this. TobyMac is usually described as a hiphop artist, but that description falls far short of the exceptional performance Wednesday night. Some of his songs are hiphop, but there are also ballads and elements of blues and jazz. It’s delivered by some of the most outstanding musicians to take the stage on the Outer Banks. The music, musicians and arrangements are just one part of what created an outstanding evening of music. 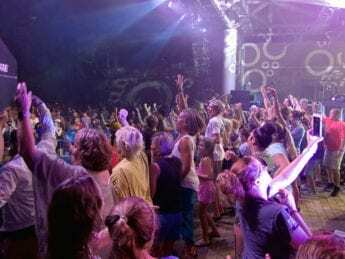 The staging and the interaction of the DiverseCity Band and TobyMac with the audience are also very much a part of the energy and joy of the performance. TobyMac delights in getting as close to his audience as he can, and part of the staging includes a runway that extends well into the crowd. He and his band go right to the end of the runway and seem to gain energy from engaging with the people — and there were a lot of them — who are right at the edge of the stage. It is the music, though, that has created his reputation, and the music is riveting. He opened the set with “Me Without You,” which is a great hiphop piece that outlines how he feels his life would be without faith. With it’s emphasis on tight rhythms and driving beat, the song seemed to introduce the band, calling attention to the drumming of “B.” Haley, the funky driving beat of Toddiefunk on bass and the syncopated chords of D-Dub Wyatt. What creates an evening of compelling music, though, is what TobyMac does with his arrangements, blending hiphop with other styles. “Light Shine Bright” is an excellent example of his genius. The heartbeat-like rhythm typical of hiphop underlies the music, although it is a slower beat than is typical of hiphop. That rhythm, though, is the only element of a hiphop style in the song. Throughout the song there is a repeating choral pattern that frames the lyrics of the song — that the lights of a city can mean many things. The music, as good as it is, as captivating as it may be, is one part of a performance package that makes for a memorable evening. “Eye on It” takes the idea of a total entertainment package to a new level. The arrangement begins the experience of the song. The sound appears to be hiphop-like with a driving, syncopated bass line and keyboards with a very electric sound playing the chords. But the drums — and in this case there are two drummers on stage — are pounding out a marching band rhythm . . . and TobyMac and the entire Diversity band march right up the runway into the heart of the audience. It is rousing; it is exciting; and it is great theater. As good as the instrumental music was, the vocals may have been even better. TobyMac’s voice is right on point for every song. The backup singing was fantastic, but one performer who truly stood out was Terrian Bass, who according to the TobyMac website just joined the group. She does not appear on earlier videos of his songs. It will be interesting to see how, going forward, he uses a voice with that much power and talent. 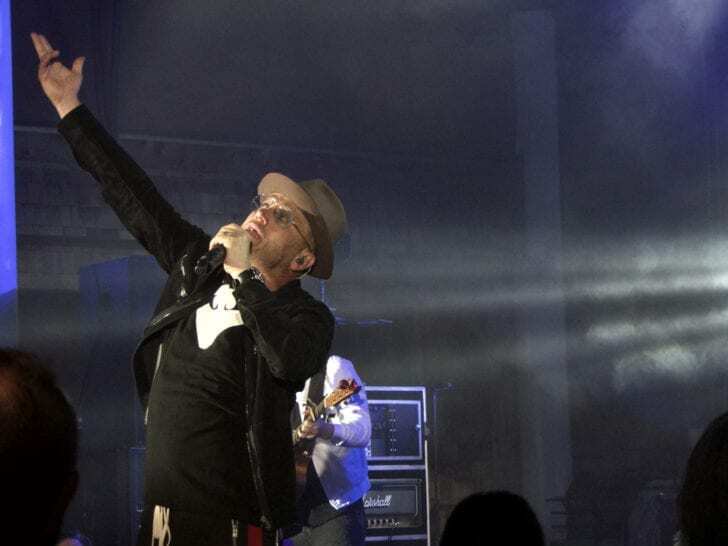 There is a lot that sets Toby Mac apart from other performers. 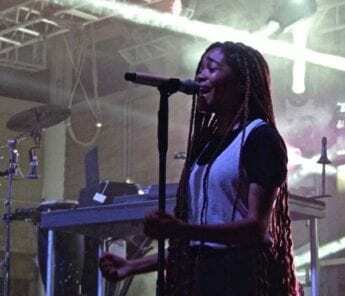 He is considered a Christian hiphop musician, and the message is certainly Christian, but his message of welcoming the diversity of the world is stated more clearly than is typical in his genre. He made a point near the end of the night of differentiating between being a Christian surrounded by Christians to being an individual in a wonderfully diverse world. A TobyMac concert is truly a family affair, actually a multi-generational affair with ages ranging from toddler to what looked like grandparents in their 60s or 70s. The attendance may have set a record for Festival Park with a crowd estimate of 3,200 to 3,300. The song is all about joy and happiness and there could not have been a better way to end the evening. Saw TobyMac 13 years ago with my daughter in law and my 3 month old granddaughter. This granddaughter is taking her first mission trip. She listens to your music in dance school.